There are some places in Ohio where I’m simply dumbfounded by the beauty. Like, standing with my mouth open, eyes widened, and slowly exhaling type of beauty. Ohio has the best of both worlds: flat land with eye capturing scenery and rolling hills and mountains filled with stunning foliage. One of the best places to see such beauty is The Wilds Nomad Ridge. Mr. Locke and I had the pleasure of spending 24 hours straight at the Wilds and Nomad Ridge, its yurt-style lodging option, and, in between the amazing meals and fun safari, we were able to capture the beauty of the land at both sunset and sunrise. A Woodland Yurt with Queen Bed. If you know what a yurt is, you know it’s a Mongolian-style tent that was both portable and durable. Originally covered with animal skin or felt, the dwellings were used by nomads in the steppes of Central Asia. The Wilds have taken the traditional yurt and “glamped” it up! Each of the yurts have either a queen or king bed, indoor plumbing (that means a true bathroom! ), and climate control. As we stayed during the last days of summer we had to use both the air conditioning and the heater. The best part about staying in a yurt at Nomad Ridge? The view! Our Woodland Yurt was on the lower level of the property and offered a stunning view of the grazing areas, zip line course- and the sunrise and sunset during our stay. If we ever wanted to tear ourselves away from our deck, there was a pretty sitting area near the concierge yurt with a fire pit and gorgeous views of the sky. Note: Nomad Ridge is for guests 21 and over, but if you really want to stay on property with your family you can always go for The Lodge– a private cabin tucked in the hills and valleys of The Wilds with its own scenic lake. There was only one issue with our visit: we didn’t get much sleep. Why? We were too busy sitting outside on our private deck snapping photographs! We found it very hard to tear ourselves away from the outdoors which was perfect. There’s nothing to distract from the beauty of nature and that was just fine. Each night stay comes both a sit-down style dinner at Overlook Café and breakfast the next morning. Mr. Locke loved the Candied Pecan Encrusted Tilapia. He actually mentioned that this one one of his favorite Tilapia cooking styles now. Dinner is served for Nomad Ridge guests from 5:00pm-7:00pm nightly and breakfast is from 8:00am-10:00am each morning. Prime Rib with mashed sweet potatoes was a great choice for me! The grilled asparagus was fabulous, too! For breakfast the next morning, we both chose a traditional style with eggs, breakfast meat, hash browns, and toast. Add two full bellies to the beautiful views of the Overlook Café and we were in scenic view heaven. Each Nomad Ridge package comes with your choice of a Safari Transport Pass or Open-Air Safari Tour for each guest, but we chose to upgrade to the Sunset Safari. This is the time of day when the animals are most active, and our Open-Air Safari bus provided us with the ability to take animals photos without the reflection of window glass. Sunset Safari is available on Friday and Saturday night only from June through September and the cost is $75 per person. Plus, just check out that sunset. I mean, who wouldn’t want to be outdoors during this kind of beauty. 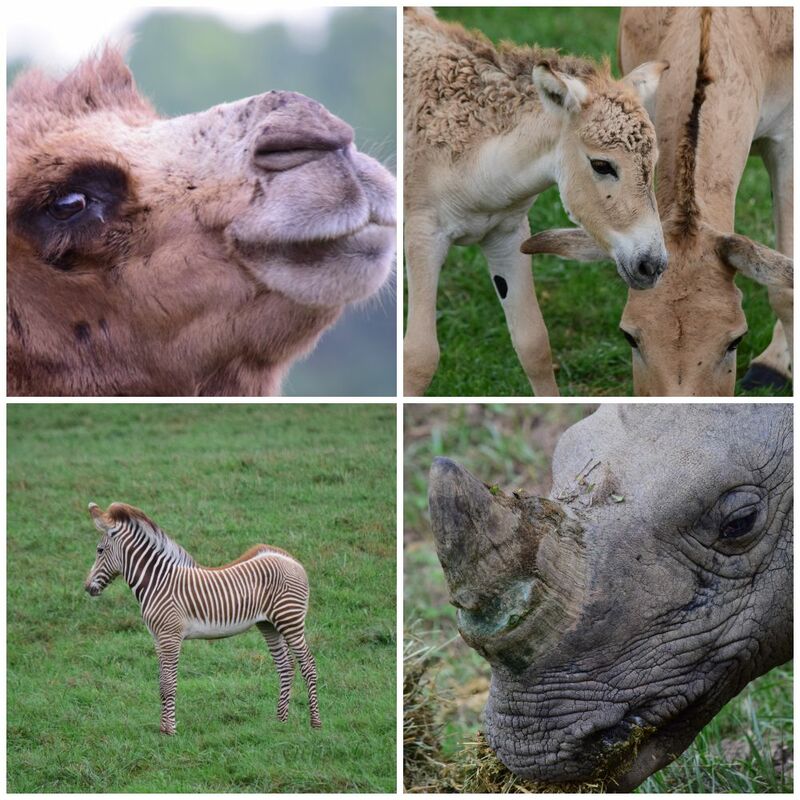 Between the Greater One-Horned Asian Rhino, Bactrian Camels, and, of course, the baby Grey’s Zebras and Persian Onager we couldn’t stop taking photos. We also spied giraffes hiding in the trees, cheetas and African Painted Dogs in the Carnivore Center, and an American icon, Bison. After the 2 1/2 hours tour, everyone on the safari bus headed back to the Overlook Café. It was buffet dinner time – including dessert! Nomad Ridge is for guests 21 and over and each yurt can accommodate two guests. The Observation Deck and fire pit is open at all times for guests of Nomad Ridge. A separate parking lot is provided for guests of Nomad Ridge. Please let the gate attendant know that you’re checking in. Dinner and breakfast are included in each package. Lunch must be paid for at time of service. Nomad Ridge offers wifi but in very limited areas. Our yurt was in the Woodland Yurt area. We had none so we walked up to the Concierge Yurt area and logged in. Don’t forget your cameras and tripod when you visit! Disclosure: I was hosted by the Wilds to give you the scoop on what makes a visit to Nomad Ridge so amazing. I was not asked to state a particular point of view and all opinions are my own! Geometry and color in their finest hour …or, remembering the crib life.